LTO (Linear-Tape Open) technology is a multi-million dollar collaboration between HP, IBM and Quantum. The LTO philosophy of openness and cooperation has ensured the backing of a wide range of tape drive, media and automation licensees, for an unprecedented level of competition within a single format. For customers, that means quality products, innovation and widespread availability at the best prices. LTO technology has been designed with an in-depth understanding of every key component in the backup/restore operation - host, interface, hardware, media, backup software, specific data types - and how these variables interact to affect backup performance. 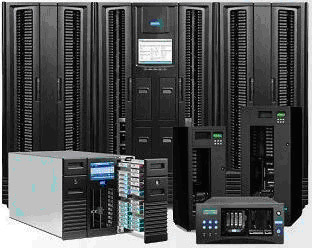 The very best features of existing tape storage technologies have been incorporated and enhanced to create a new benchmark for data integrity and reliability. Each new generation of LTO will double in capacity and performance with a single-storage native capacity of 2.5TB uncompressed and a transfer rates of over 20TB/hour. With these credible capacity and performance improvements explicitly defined, LTO technology is set to outlive all other competing tape technologies. CUC offers a variety of LTO library products with storage capacities ranging from 8.8Terabytes to over 10+Petabytes in a single library. Several library models offer web browser-based access for remote library management, enabling administrators to configure, upgrade, and monitor the LTO library over the internet from anywhere in the world, including automatic e-mail notification based on rules set by the administrator, and firmware updates. Both SCSI and fibre-channel connectivity are available to maximize SAN connectivity and performance. Multi-drive configurations support concurrent reading/writing with data transfer throughput rates exceeding 20Terabytes/per hour! Call CUC today for more LTO library configuration options and information.